Chairman’s Message – Nurol Construction and Trading Co. Inc.
From a global perspective, we have left behind a very challenging year in terms of economy and business world and started a new year full of hopes and expectations. Several negativities, such as vicious acts of terrorism in our country marking the last period, coup attempt, subsequent operations and recent political developments in neighboring countries, impeded the progress of all establishments. As the Turkish nation, we are intensively going through the effects of all these phenomena. When additionally looking into global circumstances, we can say that the global economy is rocked by the presidential elections in the U.S., the interest rate policy adopted by FED and elections held in Europe. In particular, it is not so easy to currently predict the plans of the new government in the U.S. and their effects on other countries. On the other hand, it is out of doubt that FED will increase interest rates. In the light of political and economic developments in the U.S., it has become more complicated than ever to forecast in which direction Dollar will move and this uncertainty can be expected to cause adverse effects on countries like ours. The agenda items to be disputed most in the coming period seems to emerge around the axis of relations between NATO - EU - US - Turkey. As was in the last year, China will be another element of discussion with its currency losing value and its steadily declining growth rate.Some critical headlines to be observed during 2017 will include complicated geopolitical equilibria in the Middle East and the increasing tension in the Korean peninsula. As for our nation, the budgetary deficit turned out to be approximate to the targeted value at the end of 2016, but the same picture does not apply to expenditures and incomes. Both import-export deficit and foreign trade deficit declined when compared to the previous year. The inflation rate was 8.5 percent, actualizing above expectations again. Foreign exchange markets continue being adversely affected by the circumstances currently prevailing in Turkey and fluctuations in global markets. Although the "provisional tightening" policy initiated by the Central Bank during the first months of the year managed to prevent the rise in foreign exchange rates, the rates seem to increase in the following months. Financially strong companies seem advantageous in this period, but it is of great importance to maintain this advantage. Because companies are in a state where they may falter suddenly as a result of the changing economy. Although the inflation forecast was announced to be around 8 percent for 2017, this figure is expected to increase up to double-digit figures and complete the year so. Markets are highly sensitive to inflationary expectations, because they account for one of the key determiners of pricing decisions taken by these businesses. The profitability rates associated with projects also decline due to the change in US dollar, impact of economic fluctuations on prices and rise in costs, intensifying the competition to a greater extent. We, as NUROL HOLDING, attach great importance to main our current position as is always, to act with caution, to make difference with our quality and to proceed in line with the goal of sustainable growth. While doing so, we intend to control costs and continue our recognition of permanent brand in the market by enhancing efficiency and productivity as much as possible. Nurol Conglomerate has forecasted the mean inflation rate as 8.5%, fx rate for USD to TRY as 3.58 and EUR to TRY as 3.76 for 2017 budgets drawn up in consideration of developments at home and abroad. In case of any major unexpected changes, we will be able to revise our budgets in the second half of the year. For 2017, our business plans include the development of larger domestic projects in lines of business with a high added value. 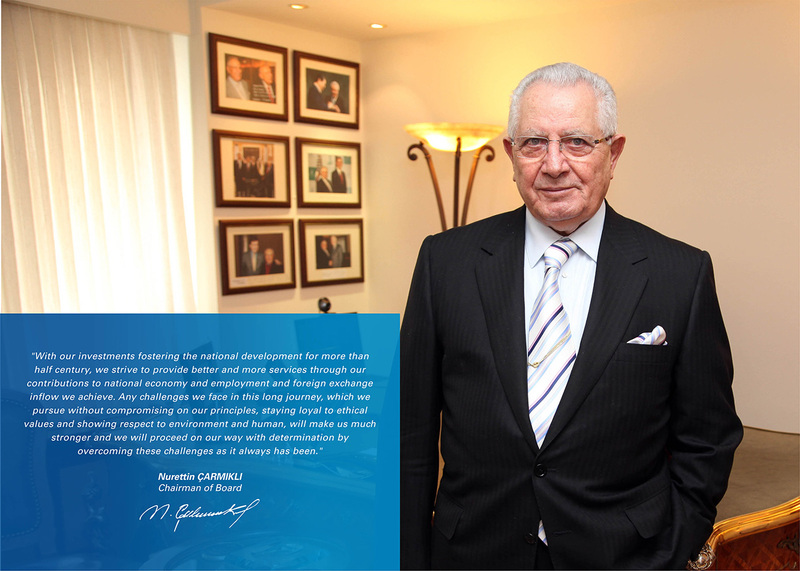 In line with our strategies, we will maintain our efforts to increase our market share in countries where we operate. NUROL continues its operations under the roof of more than 40 affiliates, subsidiaries, branches and project partnerships established at home and abroad in defense and manufacturing industry, technology, real estate investment, energy, tourism, mining, finance, trade and service industries, particularly in construction and contracting. Having an Asset size amounting to TRY 11,4 billion and Equities worth of TRY 2 billion as of 31 December 2016, the Conglomerate has been planning, coordinating and executing its operations in line with the goal of sustainable growth in parallel to developing markets and economic changes. Today, NUROL HOLDING has over 10,000 human resources, turnover worth TRY 3.9 billion and project value exceeding $ 30 billion thanks to its projects undertaken at home and abroad. We can point out that the operation field of Nurol Construction, having a major share in our revenues, encompasses fifteen countries spread over a vast geography in various continents extending from UAE, Saudi Arabia, Libya, Algeria, Morocco and Qatar to Georgia, Poland, Russia, Turkmenistan, Uzbekistan, Iraq and Afghanistan. Included in the World's Top International Contractors published by "Engineering News Record" affiliated to the American Mc Graw Hill, Nurol Construction is engaged in the following operational fields in terms of its reference projects; infrastructure projects, motorways, highways, railways and subway systems, tunnels, gas/oil pipe lines and related facilities and plants, irrigation/drainage systems, dams and hydroelectric power plants, water supply and sewage systems, urban/industrial treatment plants and solid waste treatment plants, turn-key production plants and industrial complexes, industrial sites, business and trade centers, luxurious/mass housing and social centers, hotels, holiday villages and touristic facilities. We are intensively maintaining our business development efforts to expand our operations abroad. Besides our initiatives in the Gulf Region - particularly in Saudi Arabia and Kuwait -, our operations continue in Sub-Saharan Africa, Bosnia-Herzegovina, Macedonia, Serbia, Kazakhstan, Azerbaijan, Pakistan and Ukraine. We are aware of the responsibility we assume as Nurol Family. In addition to our corporations' commercial operations, we strive to fulfill our social responsibility with projects that will provide social benefit in many fields particularly from education to culture, arts and sports thanks to our Foundation. With our investments fostering the national development for more than half century, we strive to provide better and more services through our contributions to national economy and employment and foreign exchange inflow we achieve. Any challenges we face in this long journey, which we pursue without compromising on our principles, staying loyal to ethical values and showing respect to environment and human, will make us much stronger and we will proceed on our way with determination by overcoming these challenges as it always has been. I believe that we will use efforts more than ever and preserve our unity to sustain our achievements. I offer my thanks to the members of Nurol Family working all together devotedly in line with a single objective for many years, particularly to our Founding Partners, and wish our nation and world days full of peace, health and welfare.